This house goes for a complete contemporary and minimalistic look. 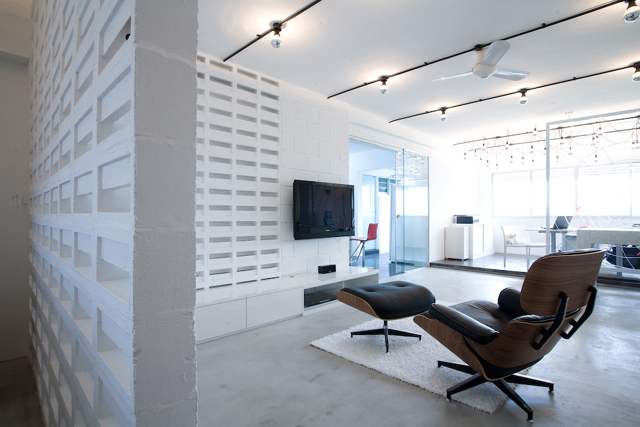 The walls are all kept white, which make the space open, clean and refreshing. The monotony is broken with stylish accents like the textured walls and keeping the wiring for lighting on the outside, properly covered, of course, and maintaining safety standards. The study is defined by a 3-D spiral room divider that is a great focal point. Instead of a wall, which would cut off the flow of an open concept, this structure still maintains a visual continuity from the living area to the study area. The kitchen also takes on the all-white approach. It is compact, but fully functional with plenty of storage and built-in appliances. A vibrant and glossy orange backsplash adds a pop of colour. The master bedroom is minimalistic, yet cosy and inviting. The low setting of the bed and lamp tables gives it an almost zen-like feel. A panelled ledge behind the bed serves as a headboard and offers some table space.